Legumes play a significant role in the production of high quality forages and pastures. As members of the Fabaceae or Pea Family, legumes have a unique place in agriculture because they serve as a symbiotic host for rhizobia bacteria, which fix nitrogen (N) from the air and convert it into a form that plants can use. Although N is not directly available to grasses, legumes increase the total amount of N cycling within the pasture system and can decrease or even eliminate the need for application of N fertilizers. This fact sheet will provide information on selection of compatible inoculant materials, proper handling methods, and inoculation procedures for forage legume seed to ensure that the symbiotic nitrogen fixation process is effective. Rhizobia bacteria live in nodules located on the roots of legume plants. As legumes germinate, the bacteria “infect” the developing roots and the host plant responds by developing a nodule. The legume host plant provides nutrients to the rhizobia bacteria, and in exchange, the plant utilizes the N produced by the rhizobia bacteria to make protein and other compounds needed for growth and development. Healthy nodules are easily visible on the root surface and will appear red in color when cut open, indicating that the nodule is actively fixing N. Rhizobia bacteria are specific with regards to which legumes they will effectively nodulate and have been classified into several groups (strains) based on those relationships. Table 1 provides an estimate of the range of pounds of nitrogen fixed annually by several forage legumes commonly grown in Wisconsin and lists the appropriate rhizobial inoculant strain that should be used for each legume species. Some rhizobia strains can also infect species of legumes other than those listed, but will not produce a nodule capable of fixing N. This is called “ineffective” nodulation, and the ineffective rhizobia are essentially parasitic. Because we cannot always be certain that the appropriate rhizobia strains exist in sufficient populations in soil to ensure nodulation, inoculation at planting is generally recommended for forage legumes. Because legumes have evolved in a symbiotic relationship with rhizobia bacteria, they are very poor competitors for nitrogen in the soil, and legumes that are not effectively nodulated early in the germination process will begin showing nitrogen deficiency symptoms within a few weeks of emergence. Typical symptoms of failed nodulation are a stunted seedling with a yellow or sometimes reddish appearance. Efforts at emergency inoculation of ineffectively nodulated legume seedlings often fail, resulting in additional costs to replant the stand. Proper storage, handling and application of inoculants at planting is worth the effort to ensure success. Rhizobia bacteria are living organisms, it important to purchase fresh inoculant products just before planting and to handle the packages appropriately to maintain viability. When purchasing, make sure that the inoculant is fresh (use well before expiration date) and has been stored in cool conditions. Upon receipt, store inoculants in a cool, dry place away from heat and sunlight until the day of use. A refrigerator is ideal. For transport to the field, use a cooler to keep the packages cool and out of the sun. Inoculants are applied directly to legume seed so that rhizobia bacteria are readily available to colonize roots as seeds germinate. Most inoculant materials for forage legumes are commonly sold in a powdered form with peat as the inert carrier. Read the label carefully to determine the rates and methods recommended on the inoculant package so that the adequate inoculant is delivered with the seed to provide effective nodulation. Plan to mix only enough seed for each day’s planting to ensure that fresh inoculant is applied to seed just before planting. Inoculant application recommendations generally include the use of a sticking agent that is mixed with the seed to adhere the inoculant. In lieu of a commercial sticking agent, use 1 part corn syrup or molasses to 9 parts non-chlorinated water. For ease of mixing, place about 25 pounds of seed in a large tub. Add only enough sticker to slightly moisten the seed and mix well, then add the appropriate amount of inoculant and continue to mix until seed is thoroughly coated. Properly inoculated seed will not be sticky and will flow freely through the planter. Repeat the process until enough seed for one day’s planting is inoculated. Fill the planter, storing the extra seed in a cool, dry place until the planter needs refilling. If inclement weather or other planting interruptions occur, re-inoculate the seed not used within 24 hours. Many seed companies offer pre-inoculated seed of commonly used legumes such as alfalfa and red clover to facilitate planting. Coatings often include clay or lime and have been developed to provide an extended shelf life of inoculant embedded in the coating. Pre-inoculated seed will have an expiration date on the seed tag that should be observed. Pre-inoculated seed should be re-inoculated if it is not used within one year of purchase or has been stored where temperatures reached over 800°F for more than 1 month. Handle pre-inoculated seed with as much care as you would the inoculant itself, and if there is any concerns regarding rhizobia viability, re-inoculate the seed according to label directions. Several companies make inoculants for both conventional and organic farm use and distribute their products through reputable seed suppliers. When purchasing legume seed, be sure that the appropriate type and amount of inoculant products needed is included with your order if the seed is not pre-inoculated. Sometimes clover and alfalfa rhizobia are mixed and sold in packages labeled for alfalfa or clovers (red and white). This can be confusing because some producers may then believe that the same rhizobia will work “universally” when such a product is actually a blend of bacteria that is only appropriate for the forage legumes listed on the label. Soil pH and fertility plays an important role in growth and development of legumes, in part due to additional nutrients needed by the plant for the symbiotic N fixation process. 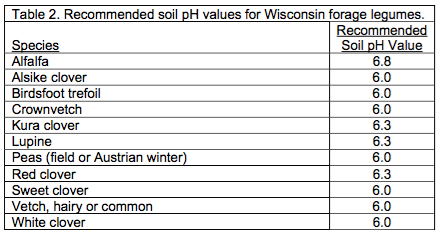 Response to soil pH varies among legume species, so Table 2 lists the recommended soil pH values for forage legumes grown in Wisconsin. Soil test phosphorus and potassium levels should also be within optimum ranges based on a current soil test recommendation to ensure successful establishment and nodulation of the legume seedlings.